In the Bears’ third preseason game, the transition to starting Mitch Trubisky under center may begin. With a move up to draft him in late April, the Chicago Bears clearly committed to Mitch Trubisky as their quarterback of the future. Free agent signing Mike Glennon seems to have a hold on the starting job this year though, tentative as that may seem. 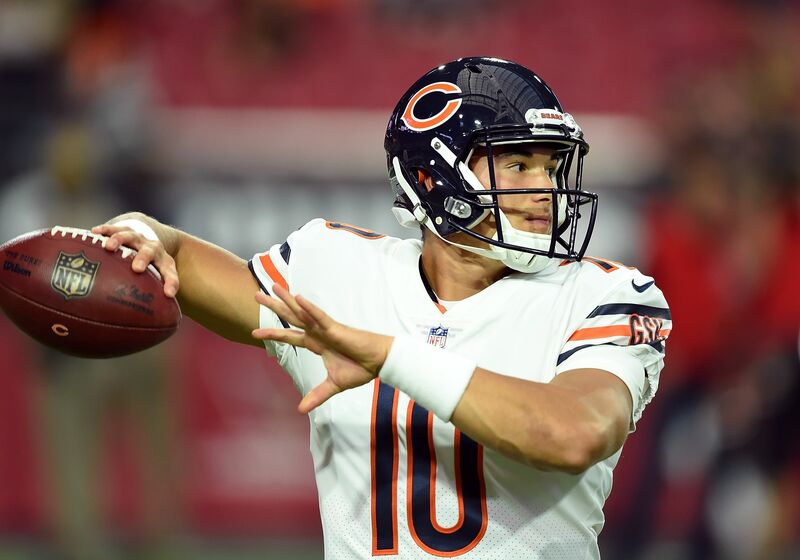 Trubisky has been the third quarterback on the field for Chicago in each of their first two preseason games, behind Glennon and Mark Sanchez. But he has played pretty well, going a combined 24-for-33 for 226 yards and two touchdowns. A step up the depth chart before Week 1 is inevitable. Trubisky reportedly got some practice time with the starters on Wednesday, which seems to set him up for some time with that group against the Tennessee Titans on Sunday. According to Jeff Dickerson of ESPN.com, that’s what will happen. To recap: Mitchell Trubisky took some 1st team reps today. Mike Glennon starts on Sunday, but Trubiksy will start 2nd half w/1’s. The punch line here is that Glennon will still start Sunday’s game. But with the first-team offense (and the Titans’ first-team defense) playing the most it will play all preseason, Trubisky will see some time with the starters too. Teams have taken different approaches with rookie quarterbacks so far this preseason. The Cleveland Browns named DeShone Kizer the starter for their third preseason game, which makes it basically a foregone conclusion he’ll start Week 1. The Houston Texans, on the other hand, have remained publicly committed to Tom Savage as their No. 1 quarterback over Deshaun Watson. The Bears are doing something in between, keeping Glennon as the first quarterback on the field but giving Trubisky a chance to work with the starters in the third preseason contest. Trubisky is unlikely to take the starting job before the regular season starts. But he’s in line to make more than a few starts as a rookie, regardless of Glennon’s health.